Delicious and fluffy gluten-free muffins, studded with fresh blueberries. A great breakfast or healthy snack. Pre-heat your oven to 425 degrees. Spray or line a standard 12 well muffin pan. Set aside. In a medium bowl, combine the oats and milk and let soak for 20 minutes. In the meantime, melt the ghee or coconut oil. Set aside. In a large bowl, combine the dry ingredients – the flour, salt, baking soda, baking powder, and cinnamon. Set aside. In another large bowl, whisk together the wet ingredients – egg, vanilla, melted and cooled oil, and maple syrup. Pour the wet ingredients into the dry ingredients and stir a few times. Add the soaked oats/milk and blueberries. Gently stir/fold the batter until just combined. Stir the batter into your prepared pan. Each muffin well will be almost full. 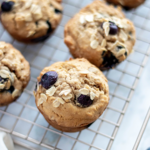 Sprinkle with extra oats, and dot with 1-2 blueberries for that perfect bakery style look. Bake the muffins for 5 minutes before turning your oven temperature down to 350 degrees. Continue baking for 15-17 minutes, or until a toothpick inserted into the center comes out clean. Allow the muffins to cool for 5 minutes in the muffin tin before transferring to a wire rack to cool completely. Muffins stay fresh for a few days at room temperature. Store in the fridge to stay fresh longer. Muffins can also be frozen for up to 3 months. For mini-muffins – bake for 10-13 minutes at 350 degrees.